Alluvial fans are deposits of sand, gravel, and sometimes boulders that were eroded from steep slopes (like mountain fronts or basin walls) and deposited on plains at the base of the slope. Erosion of deep alcoves into the walls of Holden Crater (155 kilometers/100 miles in diameter) provided sediment to these alluvial fans, which have coalesced into a large deposit called a bajada. 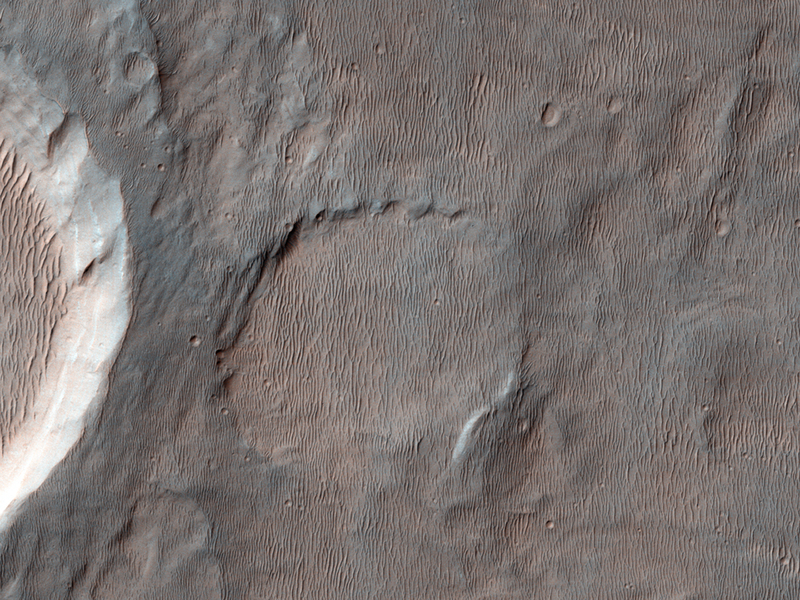 Most Martian impact craters that contain large alluvial fans are clustered between 18 and 29 degrees South, and the Holden bajada is the largest of these deposits recognized to date. Inverted channels are located on the alluvial fans, where the old stream beds were more resistant to later wind erosion than the fine-grained sediment deposited outside the channels. Preferential erosion left the channel beds exposed as ridges. Many ripples of more recent, wind-blown sand are found between the older inverted channels. The Mars Science Laboratory (MSL) would land on the bajada and drive across the traversable ripples to the south, where the inverted channels, layers, and evidence for past fluvial (water) activity are located. This is a stereo pair with PSP_007903_1535.